For the first fabrication assignment, students were tasked with creating a flashlight. When I was first thinking of the concept I wanted to create for the flashlight I began thinking about my time working in the architecture and design industry. The Minimalistic and Scandinavian design influences that I was exposed to during that time helped to give me an appreciation for simple work and clean aesthetics. 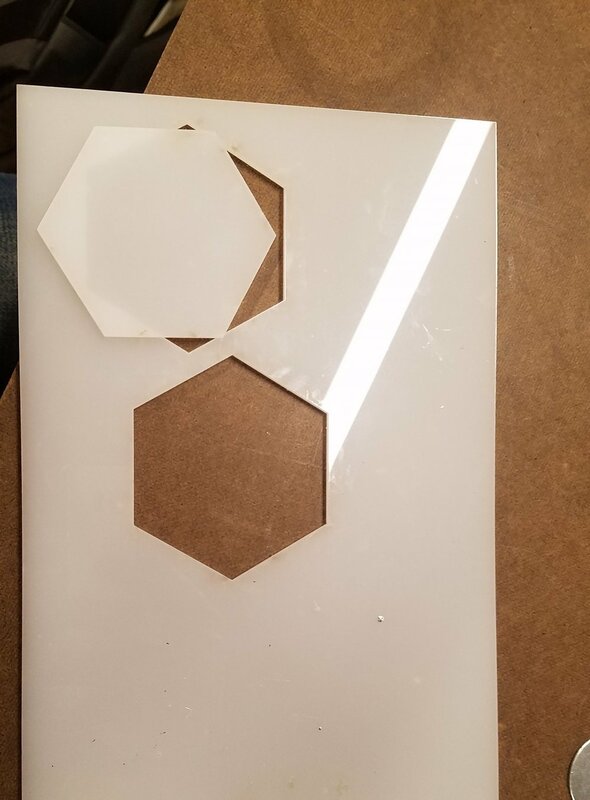 After some more thought I decided that I wanted to make a small geometric light fixture that would be best placed on a desk. I wanted the apparatus containing the circuitry to be made of wood or metal and I wanted the portion where the light was diffused through to be made of a frosted type acrylic. A few rough sketches are shown below. 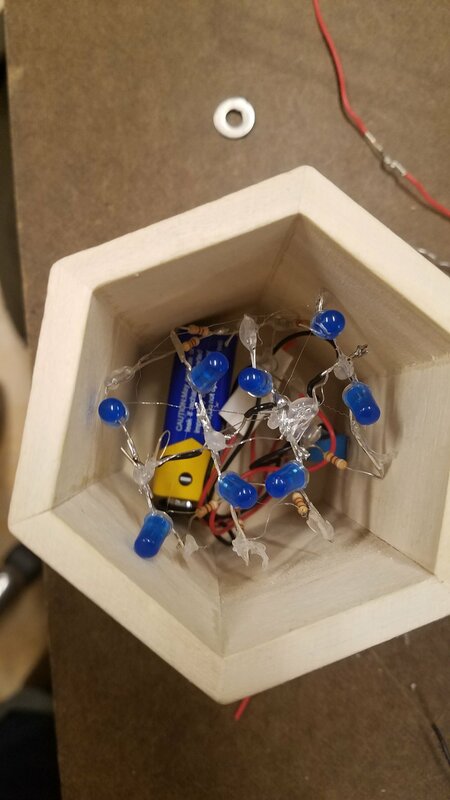 I had planned on creating the housing structure for the flashlight myself but I was able to find a small, wooden, hexagonal apparatus at Blick that seemed like it would be perfect for the project. All of the other materials besides the Acryllic sheet used for the diffusion, were sourced from the ITP shop or my own materials. The final piece consisted of eight blue LEDs and a 9V battery. The fabrication aspect of the project was not too difficult. I was most worried about laser cutting the acrylic but the whole process was much easier than I had expected. 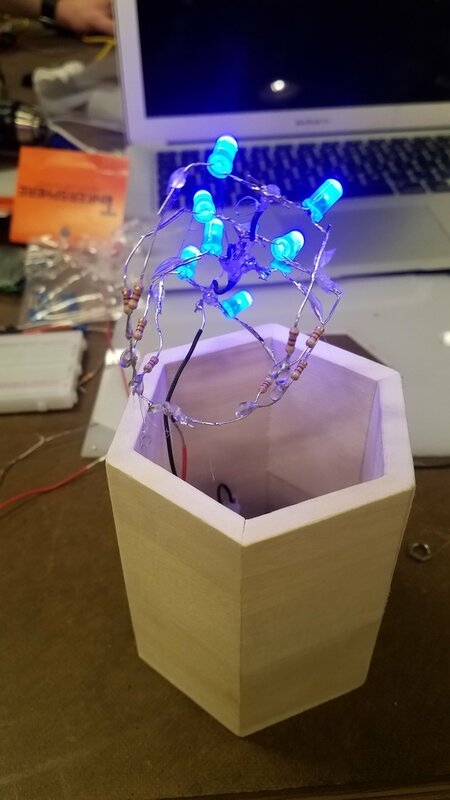 The most time consuming portion of the project was the soldering of the circuitry and ensuring that it would be able to fit inside of the container. After adding in the acrylic cutout I realized that the lights didn’t diffuse the way I had hoped and that the emitted light was much less than I expected. I still enjoy the way the piece looks and the light coming out of it looks but if I were to iterate on the piece I would try different types of diffusers. As far as the finished product goes, I am happy with the way it turned out and the cleanness of the piece. If I were to continue working on it I would, again, work with other diffusers and LED combinations. I would also refinish the switch area since it is not the cleanest hole. I would also clean up the circuit inside since I pretty much just mashed everything together then superglued it stuck inside. Lastly I would like to actually build my own apparatus.